VERY rare and fantastic, 1860's Hand Colored, Civil War Quarter Plate Cased Tintype Photograph of an armed United States Army Cavalryman with rifle, fixed bayonet, kepi and cartridge box featuring a wonderful, camp scene backdrop with a hand colored American Flag!! This outstanding, period Tintype Photograph measures approx. 3 1/8" by 4 1/8" and is housed in a period, pressed paper hard case with original matt, binding and cover glass. The Tintype is a wonderful, near full length portrait of a Civil War Union Soldier believed to be a Cavalryman (due to his knee high leather boots and riding style britches). The Soldier strikes a relaxed pose with his left hand at his hip and his right hand holding the muzzle of his rifle which stands beside him, its bayonet fixed. He wears a kepi which is jauntily pushed back on his head, a "US" belt plate, an eagle shoulder plate, a leather cartridge and a cap box. Besides the wonderful pose of this proud Cavalryman, what makes this Image extra special is the hand colored American Flag that flies over the Civil War Field camp that is illustrated on the photographer's backdrop!! Overall the Image is VERY attractive and strikingly Patriotic!! Neither the subject nor the photographer are identified in any way. 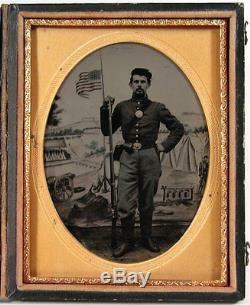 This rare and wonderful, Civil War Tintype Portrait of a Union Army Cavalryman is in very good condition. The focus is sharp, the contrast strong and the tonality rich and warm. The Tintype is clean and crisp and well preserved with a few shallow bends but no surface scratches, scuffing or significant damage of any kind. The surface is sound and stable with no crazing or flaking. Overall the Image is very well preserved and displays beautifully!! The Hard Case in intact and sound with an old repair at the spine and some surface wear as can be seen in the scans below. A very rare and original, 1860's Hand Colored, Civil War Quarter Plate Cased Tintype Photograph of an armed United States Army Cavalryman with rifle, fixed bayonet, kepi and cartridge box featuring a wonderful, camp scene backdrop with a hand colored American Flag and a fantastic addition to any collection! And Click Here to Add Us To Your Favorite Sellers List. Click Here to Discover More About this Item and Many Others on Our New Informational / Non-Commercial / Reference Blog - Walnutts. The item "1860's CIVIL WAR 1/4 PLATE TINTYPE PHOTO OF CAVALRY SOLDIER with COLORED FLAG" is in sale since Friday, June 05, 2015.